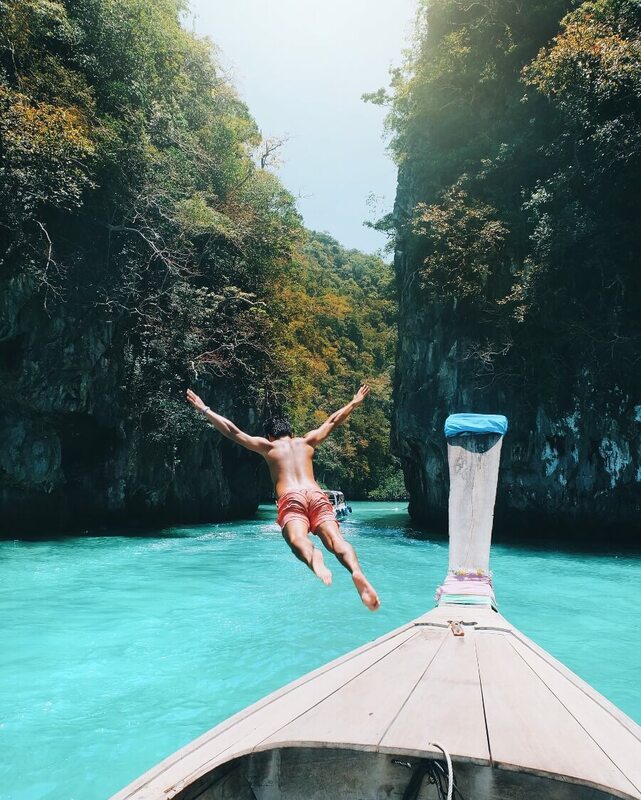 Join travel blogger @ninjarod and @maryhadalittledream to the most stunning luxury resorts in Phuket and Krabi – prepare yourself for the big surprise that swept his girlfriend off her feet! We arrived in Phuket from Singapore almost midnight. Our touchdown at the Phuket Airport took an hour longer than expected due to air traffic. After a long and tiring day in Singapore plus the flight we were only thinking of a long night sleep. Thankfully, we quickly found our driver at the airport arrival lounge, took us to the car and offered refreshments and the car’s wifi password. It was a quick 20 – minute smooth drive to the resort which seemed like 5 minutes. I guess we didn’t notice the time because we were so busy catching up on our IGs 🙂 When we got to the resort, the staff greeted with their warm smiles and gave us these fragrant flower bracelets and two glasses of champagne. We were then brought to our room, on our way we pass by the main pool that looked so LIT. That however did not distract us from our ultimate goal for the night. SLEEP 🙂 We dozed off to dreamland as soon as we hit the bed. The next morning we woke up early and strolled around the property and then straight for a hearty breakfast at The Oriental Spoon. They offer the most delectable Thai, oriental and Western fusion menu but I only had eyes for good brewed coffee and those sweet Thai Mangoes. The entire day was mostly spent lounging and swimming at our own lagoon pool which was just right next to our balcony. Today was Raj’s birthday and I wanted the day to be perfect. We got up a bit late so we had our breakfast in-suite. After our delicious breakfast went for a quick swim and then got the most amazing Traditional Thai massage at the Sun Spa Esthederm. I heard from one of the staff that they host a daily fruit tasting session for free at the Wine Room. So we decided to drop by and and it didn’t disappoint! We got to try different types of fruits native to Thailand. Raj liked the Longgans while Thai Mangoes are still my favourite. 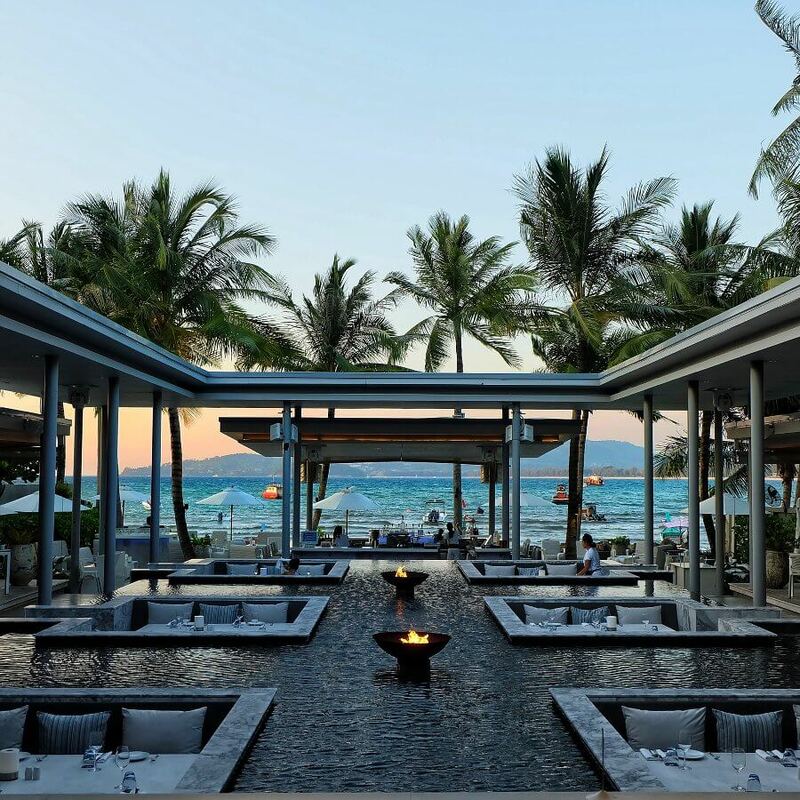 In the evening, we head over for dinner at the gorgeous Palm Seaside Restaurant and Lounge. Going here was easy breezy, there is shuttle service available every 30 minutes that takes guests to any of their 3 beach clubs. We got to Palms Seaside at around 5:30PM right before it opens for the night. We were immediately taken to one of the of the sunken marble tables that their awesome Guest Experience Team arranged for us. We watched the sunset while being poured a bottle of champagne compliments of the house. We paired it a refreshing Spicy Seafood Salad and the most delicate tasting Smoked Salmon Tartar. For our main course, went full Thai and each of us chose Coconut ice cream for dessert. YUM! YUM! The night couldn’t have been more perfect and the staff at TwinPalms made it possible. We went to bed that night with a full belly and a big smile on our faces. We got up at around 7AM in the morning for a quick jog at the Surin Beach located just two minutes across the resort grounds. The beach was calm and serene, lined with bent coconuts and screw pines. It was the best beach I have seen around Phuket so far. Right before the tourists arrived we went back to the resort for a bath. We went to HQ Beach Lounge for brunch and we much enjoyed the Tiger Prawns and Pasta. After our lovely brunch, we chilled under the pine shades, sipping cocktails. Today we are leaving Twin Palms off to our next resort destination Sri Panwa. 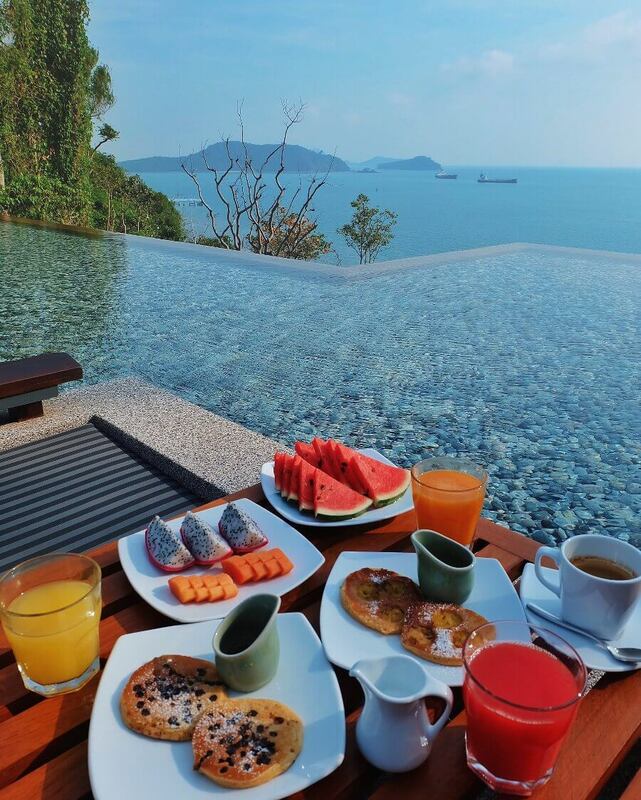 After a quick breakfast the Oriental Spoon we hopped on our ride to Sri Panwa located in the Southern part of Phuket. It took about an hour to reach Sri Panwa due to a heavy mid-day traffic but the wait was all worth it. Sri Panwa looked like something right out of a postcard. The property is nestled on top of a lush hillside that drops into a white-sand beach. From the reception area we rode one of their cool looking tuk tuks to the Habita building where we will be staying for the next 2 days. Upon arrival, we were greeted by our Villa Attendant Doi and showed us to our penthouse. Our faces lit up and our jaw dropped as we couldn’t believe how beautiful and massive our room was. 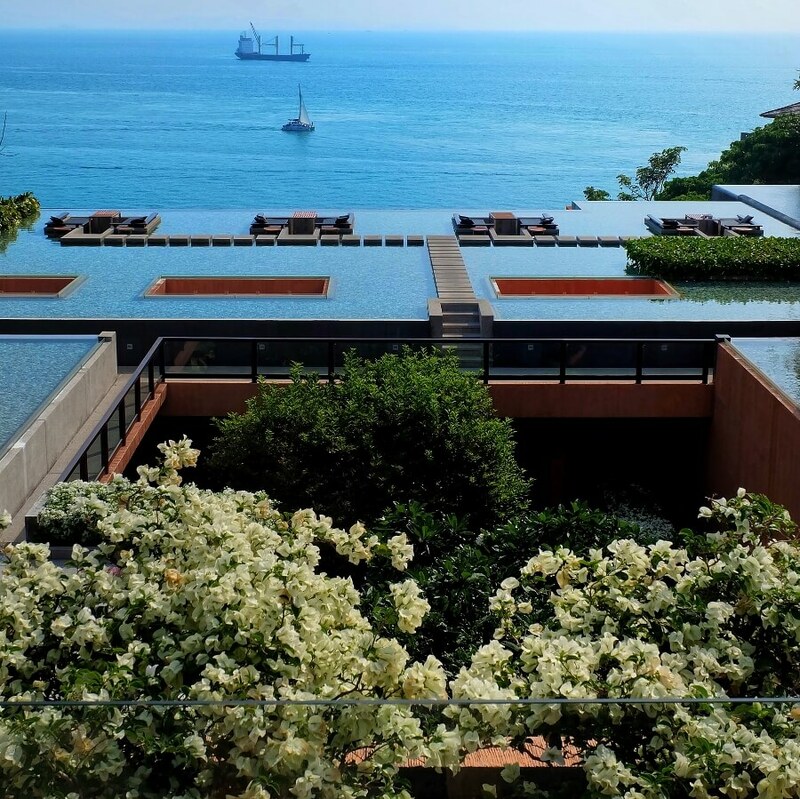 Our penthouse is very chic and airy with its own private infinity pool. It was overlooking the ocean with a view of the a very large multi tiered waterfall pool below. The room also had Wi-Fi, flat-screen TVs and iPod docks, as well as Nespresso machine, kitchen and a minibar. We quickly took a dip at our private infinity pool and then went down to the bigger Forest waterfall pool to do a couple of ‘belly flops’. Right before sundown walked up to Baba’s Nest Rooftop Bar. 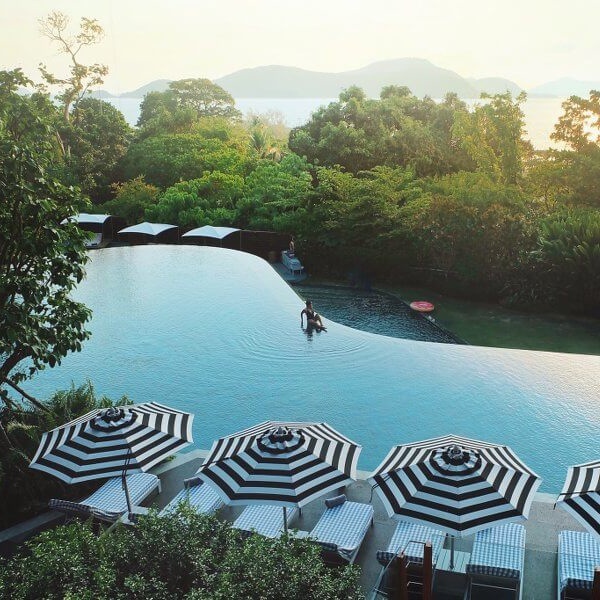 The bar boasts a wrap-around infinity pool that surrounds the rooftop deck with a 360 degree view of the Andaman Sea. We did not know we had to book in advance in order to get a table. Luckily, someone cancelled their reservation. I drank a cocktail called “My Thai Lady” and ordered a set of Mexican Tapas. 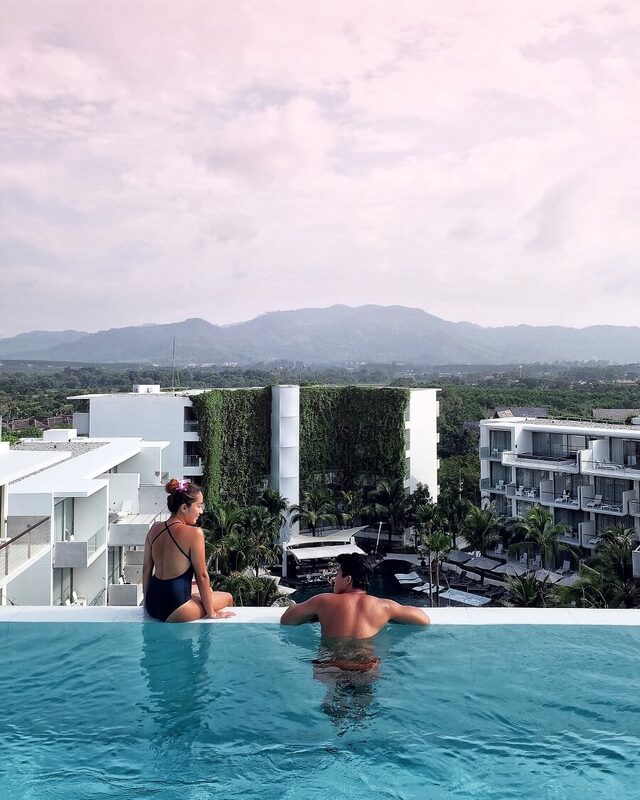 We got up at around 6AM the next morning so we could watch the sunrise at the Baba Pool Club, where we also had a fantastic breakfast with a view. After a our breakfast, I got tempted for a swim in the 25 meter swimming pool with a glass edge. Who wouldn’t? There is nothing else like the Baba Pool Club on this part of the island. At around 10:30AM when it was already high tide, we strolled down to the beach and tried SUP before we went back to our Penthouse and stayed by our private pool throughout the day. In the evening we head down to Baba Chino which is located just a couple of floors down. Their Shrimp Dumplings are to die for. We woke up and had breakfast in our room before we drove to the Beach Pool and spent a couple of hours swimming. 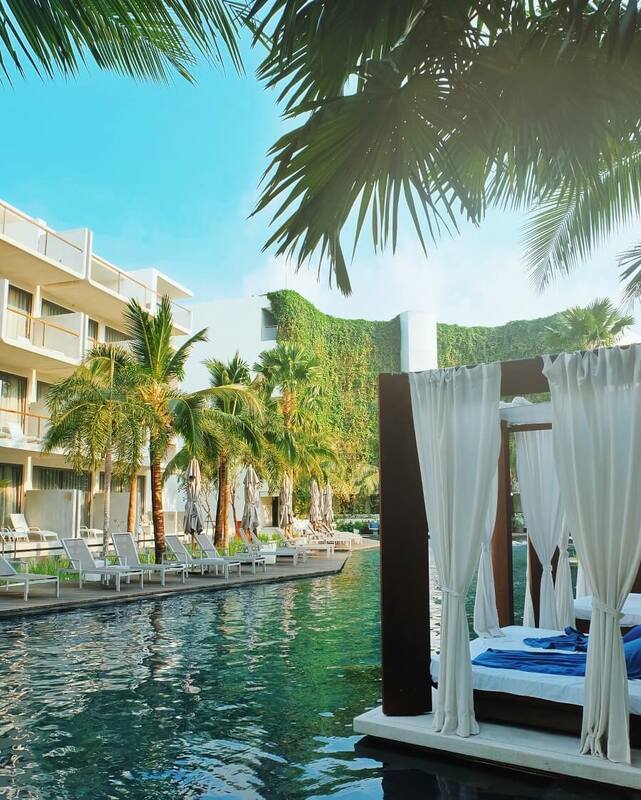 Then we head back to our Penthouse to pack our things and go to our next destination, Dream Hotel Phuket. We checked out at 12 noon and our luxury transfer was already waiting there courtesy of Dream Phuket Hotel of course. This time, it took us a good 1 hour and 30 minutes to get to our destination. The leather seats were very comfy and there was so much leg room we didn’t notice I had already fallen asleep (like babies). Upon arrival our sleepiness quickly went away as we were greeted by their friendly staff. They handed us these Pandan leaf drink and cold towels to wipe our tired faces. Dream Hotel had this modern and contemporary vibe, it was very peaceful and calming to the eyes. 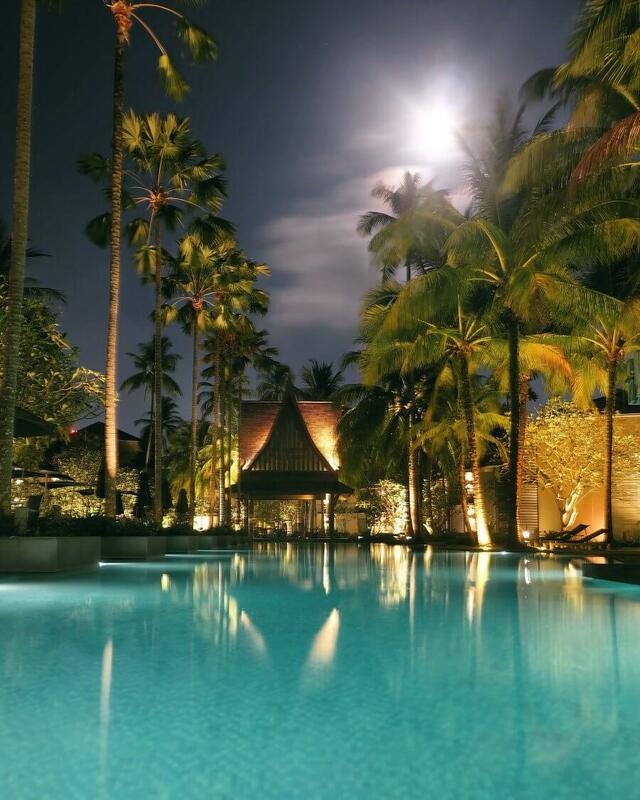 The tropical pool glistens from afar, surrounded by green walls of hanging vines and palm trees. We got up to our room, it was very polished and it had a private balcony overlooking the main pool. We were famished after our long trip, we ordered lunch at the Trilogy and we ate at one of the cabanas next to the pool. We also, checked out the 7th floor where the Vu Rooftop Pool and Bar was located. The view from up here was absolutely perfect. 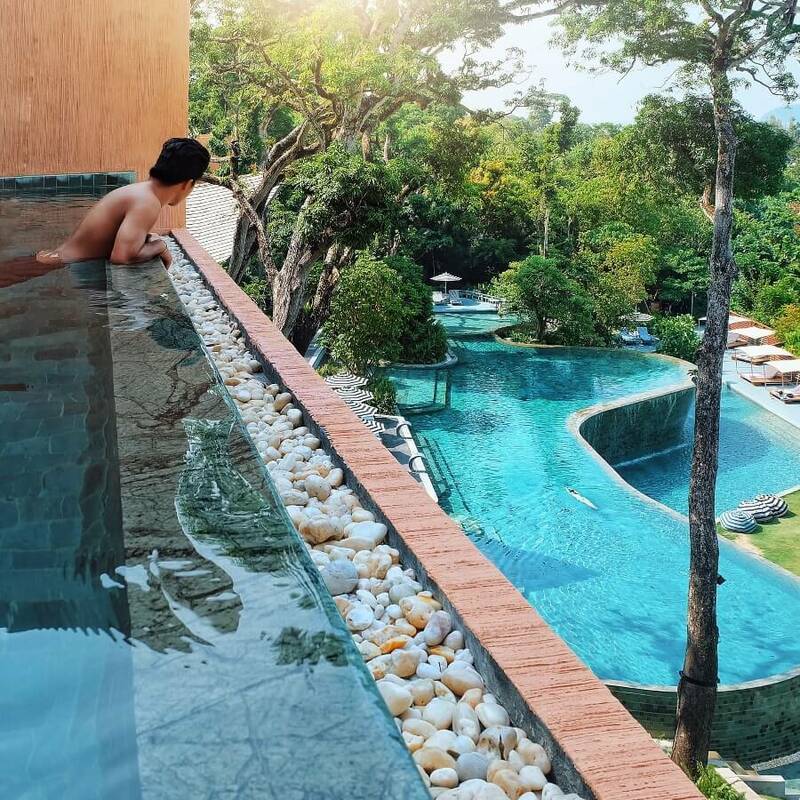 The infinity pool blends with lush rolling hills of Bang Tao with a view of the main pool below. In the evening we head over to Boat Avenue at Cherng Thalay for a Friday Night shopping and a taste of local Thai street food. Today was our last day in Phuket. We woke up at 5AM, quickly pack our things as we didn’t want to miss our ferry to Krabi. We had no time to eat breakfast, the hotel staff packed us something for take away. They are just the most awesome people! Our Ferry left Phuket at 9AM and took 2 hours to reach Krabi. The ride offers some of the most amazing views of the islands while cruising across Andaman Sea. It was definitely one of the best ferry rides I have ever experienced so far. Upon arrival, we hopped on the hotel speed boat right next to the ferry dock. It was a scenic ride to Pai Plong beach where Centara Grand was situated. 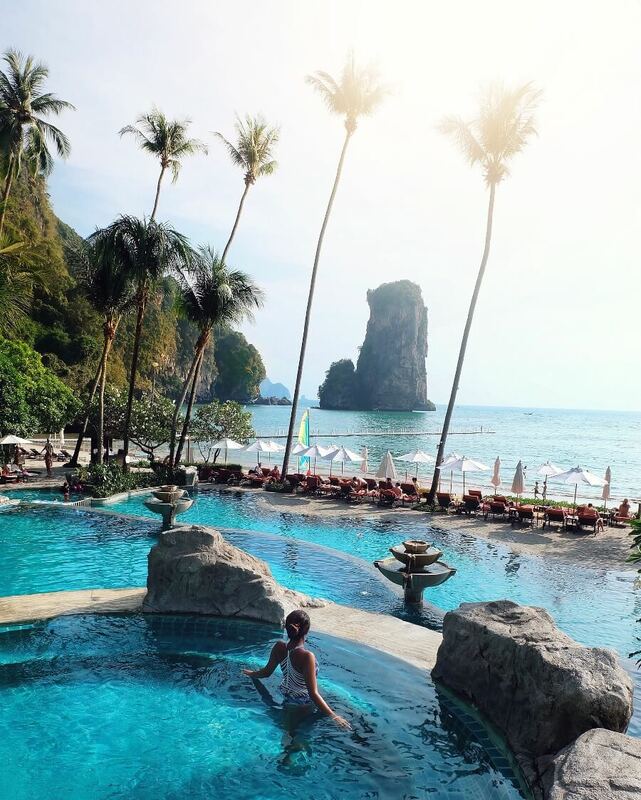 It is a long stretch of white sand beach completely secluded from the rest of Ao Nang with this massive limestone rock outcrop adding drama to the landscape surrounding the property. The staff welcomed us with refreshments and buffet lunch at the Club Lounge while waiting to get checked in. After a quick munch, we were ready to check our room which was perched up on a hillside forest. It was definitely one hell of a climb getting to our room but it had the most amazing views of the ocean. We can hear nothing but the slow rush of the wind blowing through the trees and birds chirping. 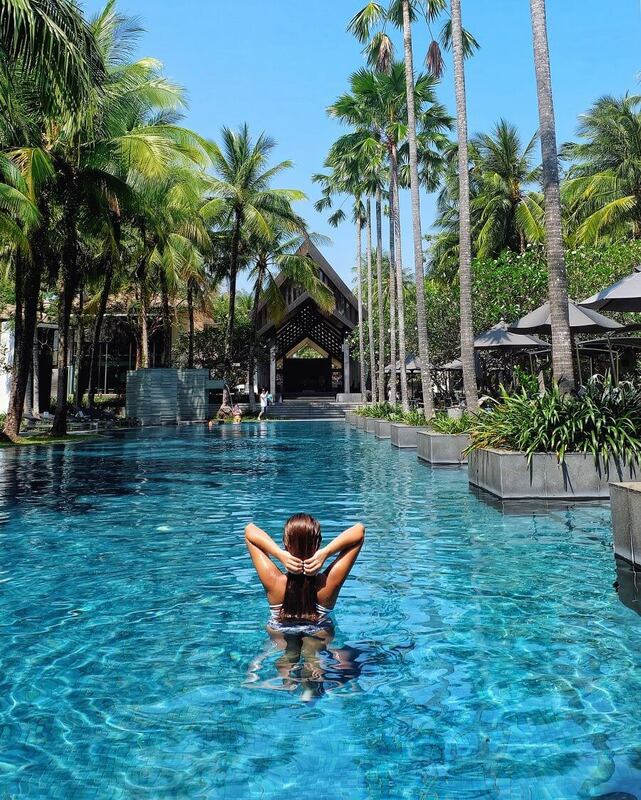 Right then and there we knew it was the right decision to make Centara the last stop of our Thailand trip. 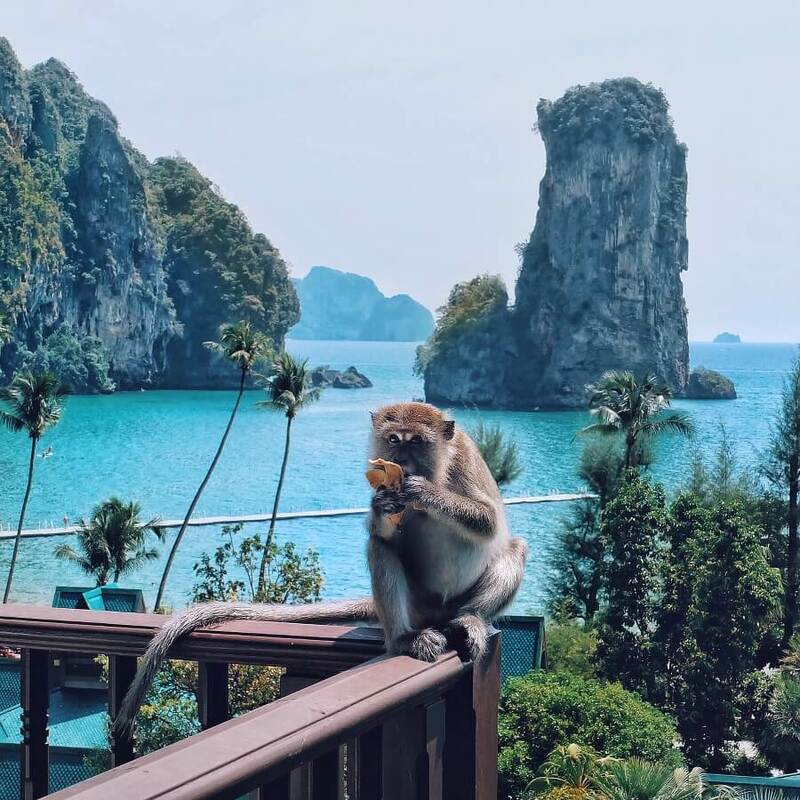 Without any hesitation, we jump right into our jacuzzi to cool down from the warm and humid Thai sun and just soaked it all in… We spent the entire afternoon mostly on our balcony and in our jacuzzi playing with some wild monkeys who came to say hi. At sundown, we went down to check out the main pool and went for a quick SUP around the rock outcrop facing the resort. In the evening, we had the best home-style Thai dinner at the Suan Bua Restaurant before be hopped on the shuttle boat that took us to Ao Nang. We walked down the streets and found local shops, bars and restaurants. After hours of walking, we went to get a massage at one of the local massage houses. We got back to our resort relaxed and ready for a good night sleep. 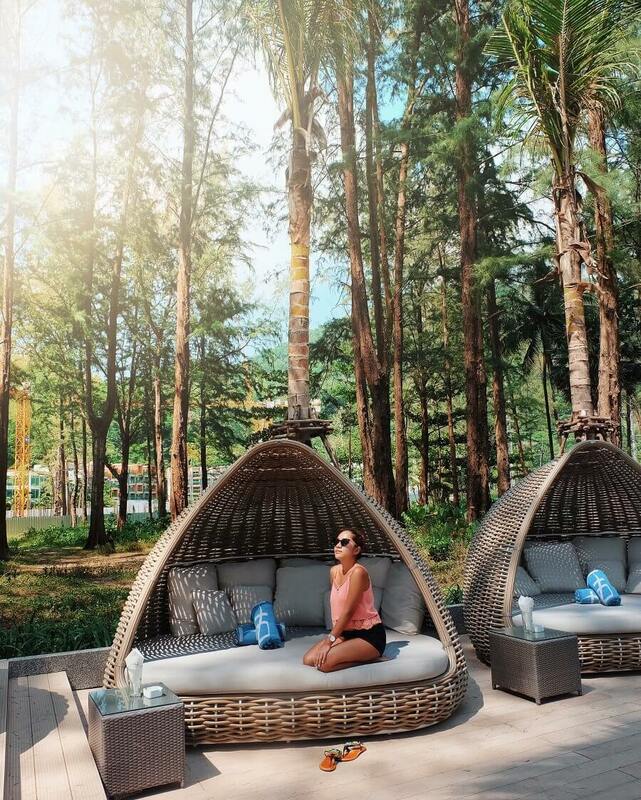 We woke up and grabbed a quick breakfast at the club lounge and then we booked a ride to Railey West Beach (the ride costs 300 Baht per person). From the resort it only took us 5 minutes to reach Railay West Beach. It was a perfect time for photo opps as there are no other tourists around yet and the tide just started to rise. We strolled the beach while we waited for our tour boat. We left Railay at around 10AM and headed to Hong Islands. I booked a private tour so there was no one else on the boat but us, the tour guide and the boat captain. Our first stop was Hong Lagoon, others call it Emerald Lagoon because of it’s emerald coloured waters. We set up lunch right on a sand bar at Koh Phak Bia. I had some Massaman curry, vegetable rice, watermelon and pineapple. In the afternoon we tried out the big swing and played with wild cats at Koh Lao Lading before head over to Hong Island main beach. When we arrived at the beach, all the tourists have left. I asked the tour guide to stay on the boat. Raj and I head down to beach, I carried my camera bag and tripod. The beach was absolutely beautiful. The sand was so white and soft to the feet, the water was so calm and clear. You can see fishes swimming in the shallows. After a few moments of planning, I thought this was the right TIME but camera battery life is already at 5% so I quickly set up the tripod before it runs out of juice. I asked Raj to stand on the beach and told her we will pose for one last photo. I set the camera on a 10 second timer. There was no time to spare so I rushed to her, kneeled on the sand. When she turned to me, without any hesitation, I took out the RING from my wet pocket, my hands trembled and voice shaking. I popped the question. She said YES! YES! YES! It was no doubt the wildest 10 seconds 🙂 We got back to our boat with grin on our faces, our boat captain and our guide had no inkling we just happened. We just got ENGAGED!!!! We were ready to end the tour but out tour guide said we still had one more stop. Sunset snorkelling. When I heard about sunset snorkelling I didn’t really understand how it works so I explained that we will snorkel the sun goes down and we won’t be feasting your eyes on colourful corals and fishes but rather on Bioluminescent planktons! Yes, glowing in the dark planktons. We dropped the anchor right next to this huge rock outcrop while we waited for the day light to completely disappear. We jumped to the water, it was warm but the current was strong. I put my head underwater and saw my feet and my hands glowing in while I was moving against the current. It was one of the most magical thing, it was like a scene of the movie Avatar. 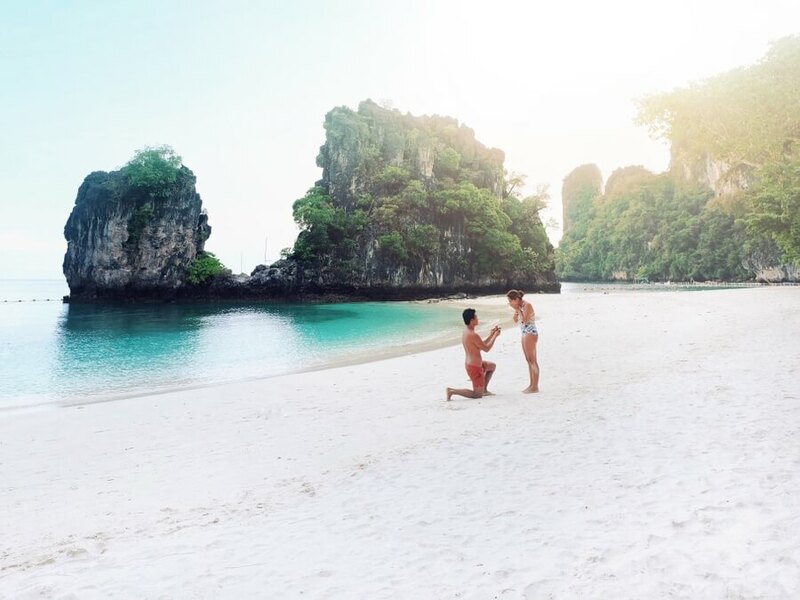 I left Thailand early morning the next day engaged to my best friend and thankful for the best 8 days of my life! 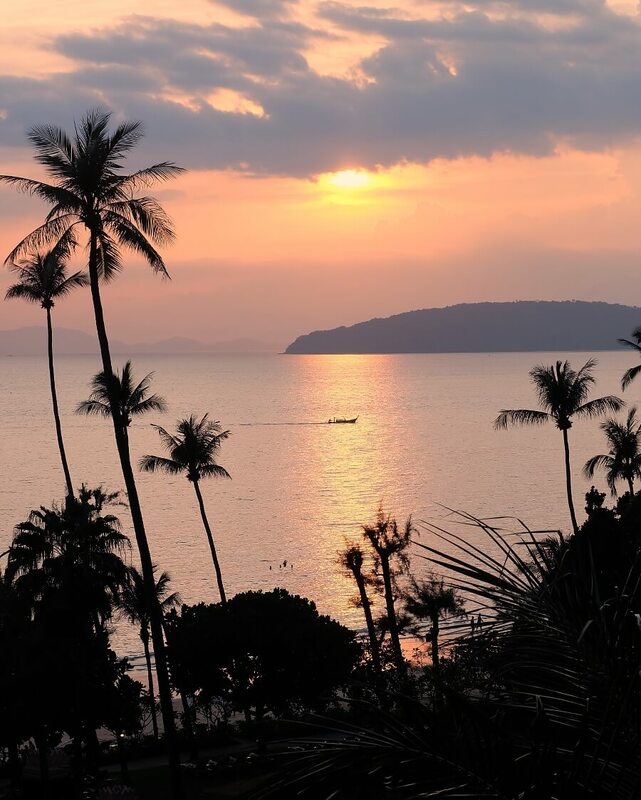 Baba’s Nest at Sri Panwa – Sunset drinks with the best view of Phuket and the Andaman Sea. Palm Seaside Restaurant and Lounge – the freshest seafood! Suan Bua Restaurant at Centara Grand Beach Resort & Villas – best home-style Thai food. 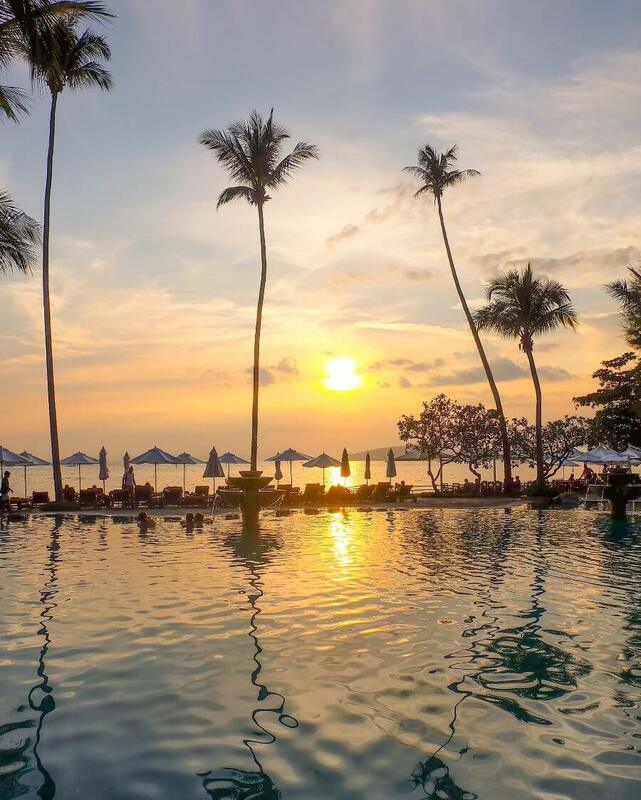 This Thailand travel diary has been contributed by Rod Ruales from @ninjarod.